Welcome back for a new OWLS Post, but before giving you this month prompt, I need to explain to the new people around here what is OWLS. OWLS stand for Otaku Warrior for Liberty and Self-Respect, we are a group of blogger and blogger promoting the acceptance of everyone regardless of their disabilities, ethnicity, gender, sexual orientation and religion. Each month with the help of the pop-culture, we exploring a new prompt given by Lyn (Just Something About LynLyn) our Chief Creator. When I saw this month theme, only one title came to my mind and I knew I had to take the series I’m about to present as support to explore the September prompt. Psycho – Pass is an original series produced by Production I.G, the first season aired between October 2012 and March 2013, it was followed by the second season which aired from October 2014 and December 2014. A movie following the event of the first season was also released in January 2015. The series also have two manga series. One with an original story following Kogami when he was inspector and the other adaptation the event of the first season. You can also found light novel and visual novel related to the series. Lately 3 new movie was announced, with the first set to be released in 2019. The dystopian Japanese futuristic world in which the characters live is world where your status is decided by how good your mental health is. Everyone lives according it the color of their Hue, darker the color is higher is the chance to get flagged as Latent Criminal. The color can change easily, just having a bad day at work might cost you a lot. Once someone get flagged, they are pretty much stripped of their rights. If they want to gain them back that have to go through treatment what will help to get a lighter hue. In the eventuality where the flagged one have no chance of rehabilitation, they will pass the rest of their life in an institution (there is exception and become enforcer). 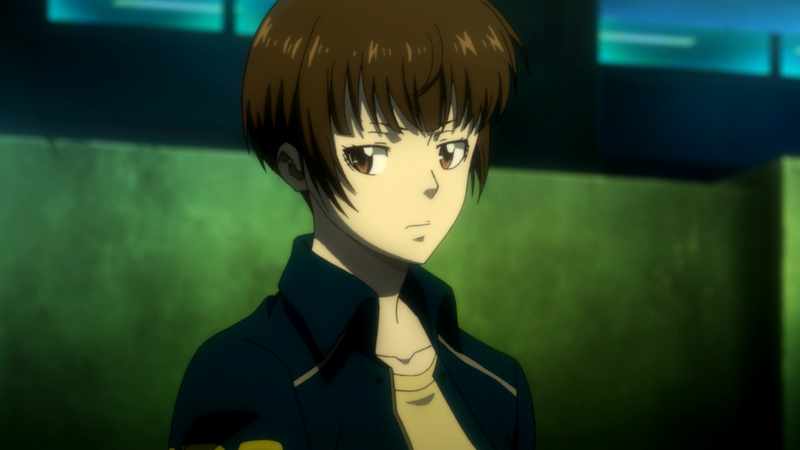 Therefore it’s it normal for those living in this society to regularly check on their Psycho-Pass and seek for a way to control it, if they don’t want to pass the rest of their life behind a windows, cut from the outside world. There is various way to keep your Hue in check, one of them is to take medication, this medicine will keep your hue in control. You can either take them on a daily basis or when you fear your Hue will get darken by some event or person.. You can also seek the help of a professional, who will give you the tools you need to be able to control your Hue. Of course you need to follow their directives and advises they will give. Good example of what not to do, is the former inspector now enforcer, Ginoza Nobuchika. Cause of is background (his father and best friend saw their crime coefficient raise to the point where the became Latent Criminal), he always fear to see his Hue change, his crime coefficient raise. He consult a professional weekly in order to prevent that, however there was time where he didn’t honestly answer the question asked, therefore his psy wasn’t able to help him the right way (OK I know that no matter what the psy would have said or done wouldn’t have change Ginoza future cause of the event of the first season), he couldn’t gave him the right advises. Another way to keep your Hue clear in to…not stress about it and this is the way Tsunemori Akane choose. She doesn’t let the event affect her, she doesn’t hold on them. In fact she didn’t really consciously made that choose, it’s just the way she is in general. Through the series (both season and movie) she had to face events that would normally had mess one crime coefficient, but she always manage to keep her hue Clear Blue and this is due to the fact that she decide to let go instead of dwelling over thing she doesn’t have control on. She is aware of the importance of keeping a clear mind, cause of her job as inspector she meet everyday people who hue darken, she know the effect and result of having a clouded Hue. I have to say that I’m a bit like her in a sense that I tried to not worried too much about thing happening in my life, I meet a lot of people who got through various mental illness and while I’m would forever be comprehensive toward them, I cannot say that I know what they are going through since I never gone through those dark phase where you wonder if one day you will see the end of it. During my middle-school and high-school year, I was bullied to the point where I was wondering if it was really worth to stay alive,it did leave it’s mark like my low self-esteem and the reason by I need to be acknowledged, however while it really affected me during those year, now when I think about it, I don’t feel any struggle other than the one mentioned, I don’t fear it happen again. I just feel a little bit sad cause those years became a nightmare instead of being a period where I should have enjoyed being with my friends. This period of bullying lead me detach myself from event that could hurt me, I created some kind of shield and state of mind where I make sure that I don’t let the event affect me too much. Sure I have those moment where I worried about work, but it’s just for a brief moment. Soon as I start worrying about thing that could bring me in a negative state of mind, I push it away and let thing happen. I do work hard, but I can’t control everything, so I rather not think too much about it and let thing happen instead of over-thinking it to the point I get sick and stress about it. Yes there is time I need to vent and just let out what i have on my mind, but once it’s out, I turn the page and pass to something else. I will not waste my time on something that happen on the past and try to focus on the present instead. I am known for being comprehensive and empathic, I understand one can be suffering and face struggle in a situation where I will just walk away without thinking much about it, I just can’t bring myself to over thinking about those kind of stuff cause I know they might just destroy me, the only moment where I think about work is when I’m at work. Soon as I walk out my workplace, I start thinking about the next blog post I want to write about, about the latest theory I read, the next nendoroids/scale figure I ordered, the new fanart my favorite artist have posted on Twitter. I always find a way to let go everything (Let it go playing in the distance) and surround myself of thing I like. Of course not better than anyone, I know the importance of taking care of our body and mind and that’s probably why I decide to protect myself this way, I’m independent, but not that strong. I know one day it might strike, I might have face a time where I will have to stop everything and just take care of myself before thinking about the other. The people who have gone down the path of depression and social anxieties and came back victorious are the strong one. People like BiblioNyan and Lina (Tiny ugly animal) are the strong individuals, they are fighter that I’m proud to know. And since I never have to go through those dark moment, I can’t really give advises, I can only be there to listen and hope for better day, that’s is why my DM are always open if someone need to talk. Mental illness are like the psyche cancer, they are real illness however due to the taboo and stigma, people don’t want or like to talk about it, don’t want to seek for help when they need it by fear to be judge by other. It can strike anyone, even the strongest and while I never had to face it, I know who day it might have to get through that dark path (I seriously hope not tho). In first I really wanted to talk in-depth of how in a world where having unstable mental state can be dangerous there was why to keep our freedom without having to stress about losing it. However I quickly lost track of that. While I could have just deleted everything and start from scratch, I decide to talk about what I do to stay in a good state of mind. I said it, I never face depression are social anxieties. Yes I had those moment in middle/high school where I got sick just to the thought I had to talk in front of the other, but the number of time it happen can be count on one hands. Also I can’t deny the fact that it will happen one day, we are living in a harsh world where we have to live up some expectation set by the society. I hope the day I will have to pass through that dark tunnel, I will not quite and continue until I see the end of it. Don’t forget to read Scott post that was published yesterday (September 19th) and check out for Mistress post which should go up tomorrow (September 22nd). You can find the full OWLS Tour schedule here. That is a great way to deal with issues and it is nice to vent and then be able to move on. I’m sorry to hear that you have been bullied. I can totally relate as I have had the same happen to me In a strange coincidence I saw the anime film A Silent Voice today and posted the review for it a few hours ago, and well you guessed it, it is a film about bullying. I wish I could say that time in my life has left me without scars, but…it hasn’t. I do say, that time certainly makes things better, and that there are people that are struggling more than I am, and the two lovely individuals that you mentioned in this post are certainly two that I very much look up two as well. They are true heroes, in every sense of the word. The bullying is a dark part of my past and I wish I could just forget about it and pretend it never happen, but while I more a free spirit now and try to not think too much about what others think about me, I still have my moments of doubt. But if I stop to think about it I will go nowhere, so I rather not let me affect and continue to go further in life instead of worrying about thing I just can’t control. I have pretty much the sam attitude. At a certain point I stopped caring about people who thought I was worhtless and started thinking” If people don’t like me? Tough, it’s their loss” That certainly helped. In the end time makes things better, but while it will always remain a part of me, I try not to let it controle me. Great post. Bullying is a terrible thing and it really can leave some awful scars. I’m glad that you can vent and move on, it’s a good way to deal with things when you can. It important to be able to vent, let out the steam and stress that will just make your like more difficult. I now I’m not invincible, I’m not naive, one day it might just it me. But for now it work and as long as it work I will be fine. Interesting take on the theme of the month. I especially like the Ginoza vs. Akane comparison! Like you and others have said, those moments will never vanish from your life completely, but I’m glad you’ve found a way to cope and carry on. Bullying is awful. 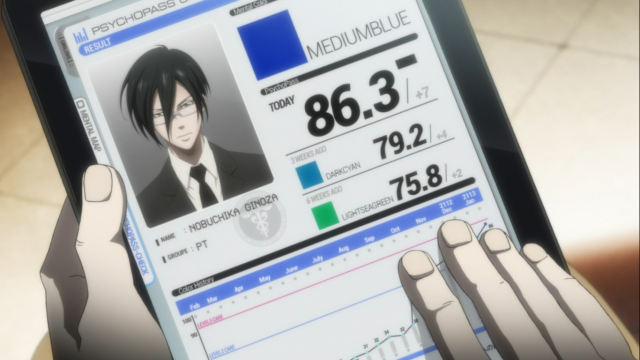 Mel in Anime Land [OWLS Tour] Clouded Mind, Clear Hue, What do I do to Keep my Psycho-Pass in Check.